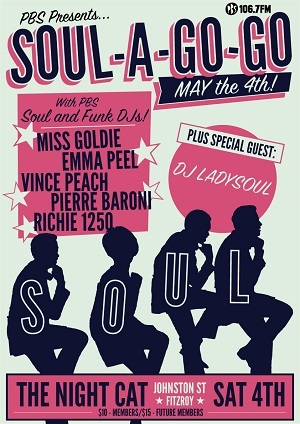 Soul A Go Go is back this May. Get down low and catch PBS’ own, Miss Goldie (Boss Action), Pierre Baroni (Soulgroove'66), Richie 1250 (Stone Love), Emma Peel (Switched On) and Vince Peach (Soul Time), plus guest DJ Lady Soul. Don’t miss Melbourne’s best soul and funk party, Soul-A-Go-Go. Saturday May 4 at The Night Cat –$10 for members – $15 for future members. SOUL A GO GO, proudly presented by PBS! This is a Bandmates Victoria friendly event. The Night Cat is a wheelchair accessible venue, see their website for details.